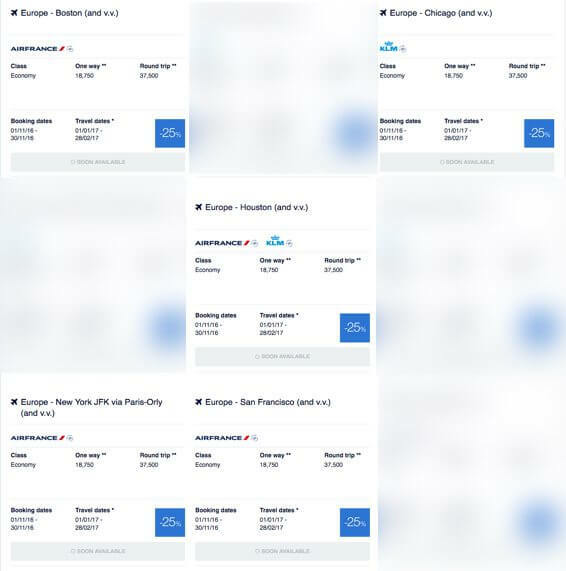 This month’s Flying Blue Promo Awards include discounted coach award flights to Europe from Boston, Chicago, Detroit, Houston, New York (JFK), San Francisco, and Washington, DC. You’ll pay 37,500 Flying Blue miles plus taxes and fees for a coach award seat, which is less miles than you’d pay for similar flights on Delta or United Airlines. Even if you have never flown on KLM or Air France, you might have points that transfer to the program. Because you can transfer Chase Ultimate Rewards, AMEX Membership Rewards, Citi ThankYou points, and Starwood points to Flying Blue, at a 1:1 ratio! I’ll show you which dates you can travel with these discounted tickets. And share ideas about earning more Flying Blue miles, saving money on flights within Europe, and more! Flying Blue is the frequent flyer program for Air France and KLM. Each month, they offer discounted award tickets booked with Flying Blue miles. Unfortunately, this month doesn’t include any discounted Business Class flights departing from the US. You can travel between January 1, 2017, and February 28, 2017, if you depart from Boston, Chicago, Houston, and San Francisco. There’s also a discount on Air France flights from New York (JFK) to Paris (ORY) for the same dates. You can also travel between February 1, 2017 and February 28, 2017, if you depart from Detroit, New York (JFK), or Washington, DC. To get this deal you’ll have to book your flight by November 30, 2016. The Flying Blue Promo Awards for November 2016 can be a good deal for folks planning winter travel to Europe. I’d certainly pay slightly higher taxes and fees to save 22,500 miles! But keep in mind, the taxes and fees depend on your routing. So do the math to make sure you’re getting the best deal! Save Miles & Enjoy a Winter Getaway to Paris With Discounted Flying Blue Promo Awards! The valid travel dates for this deal include Valentine’s Day. 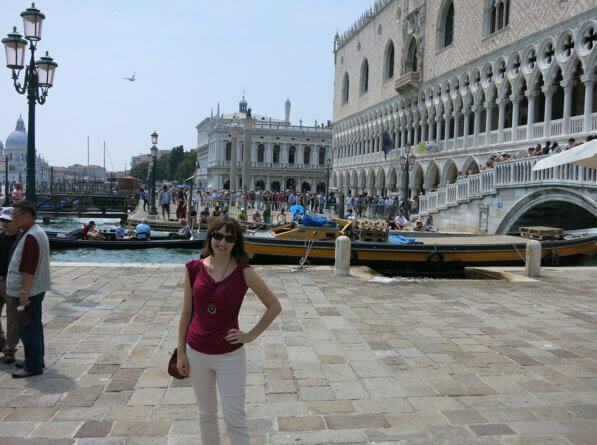 So this could be a great time for folks looking to book a romantic getaway to Europe! Chase Ultimate Rewards points, American Express Membership Rewards points, and Starwood points transfer to British Airways. Or sign-up for the Chase British Airways card. Or look for a cheap paid flight! If you need more miles, you can transfer to Flying Blue from all 4 flexible point programs! 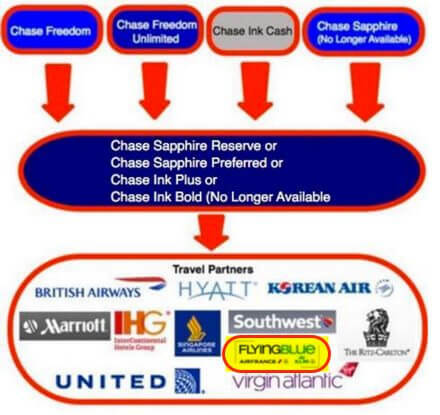 You can transfer Chase Ultimate Rewards points earned from the Chase Sapphire Reserve, Sapphire Preferred, Ink Plus, or Chase Ink Bold (no longer available) to Flying Blue at a 1:1 ratio. Or you can transfer Chase Ultimate Rewards points from the Chase Freedom, Chase Freedom Unlimited, or Ink Business Cash, if you also have 1 of the other 4 cards. Transfer Chase Ultimate Rewards Points to Flying Blue to Book Your Discounted Award Flight! You can transfer AMEX Membership Rewards points to Flying Blue at a 1:1 ratio. And you’ll earn AMEX Membership Rewards points with cards like The Platinum Card from American Express, The Platinum Card® from American Express Exclusively for Mercedes-Benz, AMEX Business Platinum, Premier Rewards Gold Card from American Express, or AMEX EveryDay Preferred. And sometimes there are transfer bonuses between American Express Membership Rewards and Flying Blue too! You can also transfer points earned from the AMEX Starwood personal and the Starwood Preferred Guest® Business Credit Card from American Express to Flying Blue at a 1:1 ratio. With this month’s Flying Blue Promo Awards, you can fly from cities like Boston, Chicago, Houston, New York, and San Francisco to Europe and beyond on KLM and Air France at a 25% discount. You’ll pay 37,500 Flying Blue miles for a round-trip coach award flight when you book through the Flying Blue Promo Awards site by November 30, 2016. Discounted flights are valid for travel from January 1, 2017, through February 28, 2017. And certain cities include travel from February 1, 2017, to February 28, 2017. 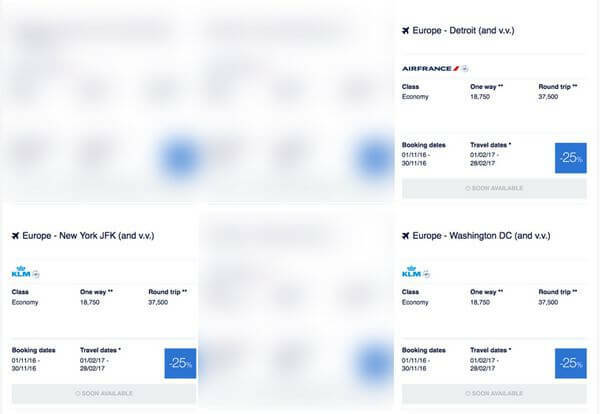 This sale isn’t as good as previous sales, which have offered up to 50% off award tickets and Business Class award flight sales. And Flying Blue charges taxes and fees. But you’ll still save miles compared to booking with other airlines! And because Flying Blue is an airline partner of all 4 transferable points programs, you can transfer Chase Ultimate Rewards, AMEX Membership Rewards, Citi ThankYou, and Starwood points to Flying Blue at a 1:1 ratio. So it’s easy to get Flying Blue miles for your trip. Question unrelated to the discounted flights. If I use Flying Blue points to book a Delta flight to Europe, would I still get hit with the fuel surcharge from Flying Blue? Thanks! They charge them on Flying Blue flights, but not on Delta flights. Are there any other destination cities other than Paris? @John Rambo MacGyver – You can fly to any Air France or KLM European destination. It just depends on your departure city. @E – With this deal, you can visit any European city with Air France OR KLM service. For example, this deal is good from New York (JFK) to all KLM European destinations. And from Detroit, you can fly to any Air France European destinations. Depending on your travel plans, the 25% discount can still be a good deal.